I have always appreciated trains. When I was growing up, I watched them build the PATCO High-Speed Line from Philadelphia through to Lindenwold, NJ. The tracks ran along a disused track that went to Atlantic City, NJ in a more Mass Transit oriented day. I remember seeing the last freight train on that line, then the work cars coming through and laying the Third Rail for electric power. After that, the whirr of the High Speed Line was a companion through my youth. I took that train, and the SEPTA Regional Rails most of my work years in Philadelphia. Made a lot of sense to do so, you could use them, leave the car at home, and not have to pay for parking. Since Philly has a compact central business district, I took on the stereotype of a Philadelphian - I walk everywhere. 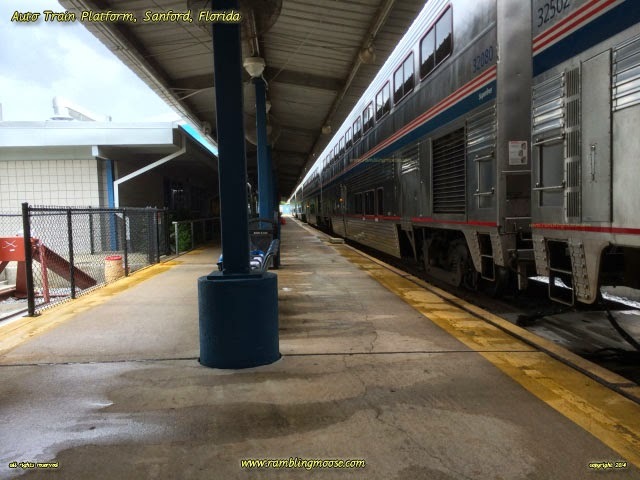 I even got to take the Auto Train as a child, and enjoyed the experience. When I returned to it as an adult, I found that my 6' 4" frame simply could not sleep in the so-called recliner seating that they had in Coach. It was either upgrade or drive. I've been told that the seats have been upgraded to make it more comfortable, but I haven't had a need to leave the state let alone South Florida since arriving here in 2006. Looking at this picture of the platform, I had two thoughts. One was the excitement of the vacation. The anticipation of going somewhere far away, to meet friends and family, see new things, get caught up on old times, and generally have a blast. The other was my time waiting for the R7 or the R8 to arrive to get me either home or to work. They ran well when they ran. At least they did. Being away from the trains for all these years, I have heard that Septa got very expensive lately and also very crowded. It's all a matter of finance. It is difficult to get a transport system to generate a profit. Too many other ways to go from point A to point B, and most of them are financed and subsidized better. Cutting corners is always noticed, whether it be lower quality seating or more infrequent service, all of which are a symptom of shortsightedness in those decide where tax dollars go to support infrastructure. If the train doesn't go to your area, then you will not be interested in supporting it and the Corridor services of the Northeast and California are both poster children of that sort of funding neglect. But rails do have their target audience. Bulk. Any time you can send bulk cargo somewhere, it normally is cheaper by rail. Whether that bulk is Oranges, Coal, or just our collective back-sides along with our cars going on vacation. The virtue of a dedicated road bed makes for more efficient traffic. When railroads were originally built, the Federal government gave large tracts of land to the railroad companies in order to subsidize their construction. While it opened up the country, it also made for profitable railroads since the land was basically free to the rails. You could sell that land off at a premium and fund the construction of tracks. That business model worked well through the 1940s. When the suburbs were being built in the 1950s, the local street-car routes weren't able to keep up with the building pace, and it showed the need for more roads to be laid. Since roads were local, and railroads were regional, the politicians shifted funding to the competing street network and the railroads began their decline. It became dis-economic to run a rail network against a free interstate road system, and by the 1970s, the big railroads of the past were dying on the vine. There are a few left, as evidenced by the FEC tracks that run near my house serenading my neighborhood with their whistles, and where appropriately funded, they thrive in concert with the road networks. With the idiocy of adding toll lanes to the interstates that your tax dollars have already paid for, I suspect that mass transit may start to get better funding. That is if the greed of the politicians can be stopped so that the right thing can be done with that funding source. After all, those toll lanes on the free interstate system will slow down everyone else who isn't using them. May as well take the regional train system since you have to pay to go anywhere. After all, if you need to go somewhere that the trains go, it's much easier to let them drive you there instead of having to find parking, get gas, and so forth. Eventually it will all swing back to a new balance. For now, if you want to bypass 900 miles of driving, you have to get to a platform like this.